Its been a while since my last post related to Adobe Lightroom Tips. 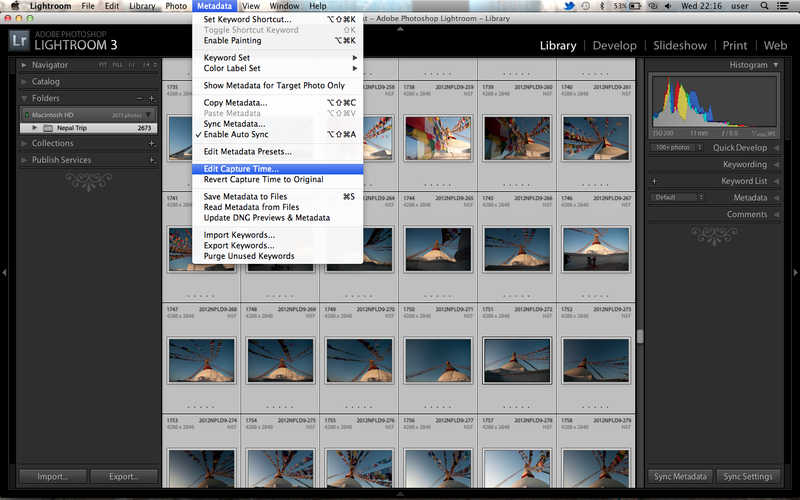 There are hundred of features in lightroom that i have no idea where to start with. This post might be useful for those who travelling more often which involving the time zone difference. It happened to me too when i was on our trip to Nepal last week. Altering the time zone in my camera has never came in my mind while i’m there until i reached home. It wasn’t a big issue, but i want the capture time to be relevan to the local time where the images were taken. I can’t imagine having sunrise at 9AM in Asia. 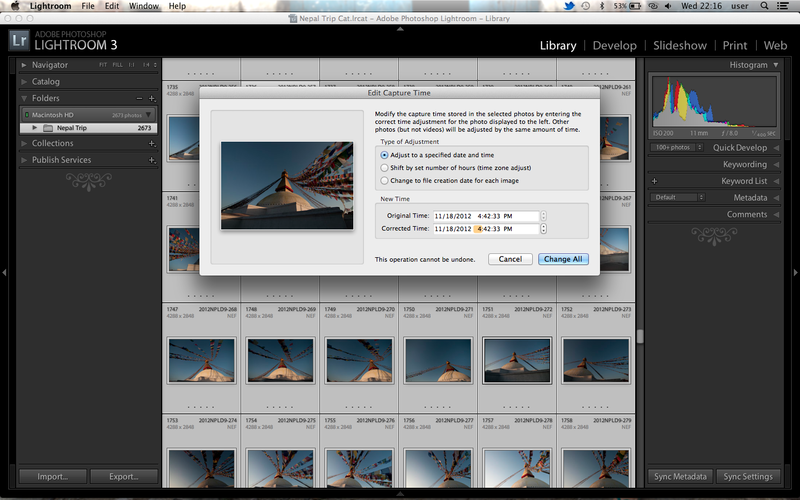 -after importing photos, i selects the images that i want to time zone adjustment. 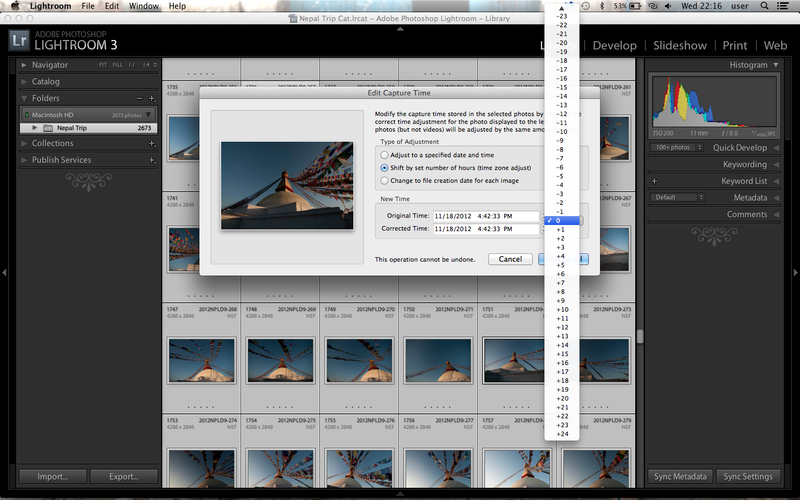 I prefer to view images in grid view (G) so i can view it in smaller thumbnail (+/-) and easily identifying which images needed time adjustment. -There are 3 type of adjustment/way to edit the capture time, i would like to just use the second option by shifting number hours but i need to alter -2hours and 15 minute. -So i choose the first option by entering the correct time. -Click “change all”, a friendly reminder will appear to confirm your action as this could not be undone. While this post being publish, we are probably in our lines to enter customs & immigration security check to Kathmandu, Nepal. Our flight are scheduled to depart at 0855hrs. It was the sms i received early that morning as i’m getting ready to go off work. We keep on replying sms while i’m sitting on a public mini bus to City Centre. Its was a though decision for me to decide and yet need to think it quickly before the promotion ends (ends on 16th July according to the advertisement). Wazari & Waja had made their reservation last night and they have about 24 hour to really confirmed their decision. At 7pm that day, Wazari called me and tell me that they have bought the ticket together with another friend Fu Ad, which i guest the guy that always travel with Wazari. Wazari informed me that they took the flight seating too. So that night, i’m the only one not yet buying the ticket. 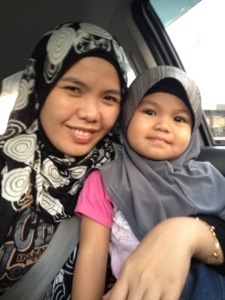 Beside of worrying much about the ticket, i kept on thinking about my wife and daughter cause i never leave them such a long period of time. Furthermore, it is our 4th wedding anniversary on the 21st November 2012. It was not easy and i need to make sure to tell her in the right time, but it must be that night. I need to buy the ticket today. But the can i get the money from? I made phone call and discuss if i could loan and deduct my salary RM400 per month for 4 month start from July salary. It was approved and quickly i paid the ticket online and now i’m too have the ticket. I have shared this news to a good friend, Azman Jumat before proceed buying the airline ticket and wondering if he wants to join us too. But i guest he need to give priority to other commitment. But i keep on asking if he interested, and hope he will join us soon. Today, i bought another ticket from KK- KUL – KK, i live in Kota Kinabalu, i need to go Kuala Lumpur in order to be able to connect flight to Kathmandu. I’ve been surveying and comparing flights fare between Air Asia and MAS. I decided to go with MAS as the Air Asia fare are too close with MAS. Plus baggage and tax, the rate difference is just about RM50 per way. With MAS, i get baggage for free (25kg) and food in board.I don’t need to expense more on time and money by waiting for bus connecting LCCT (Air Asia Terminal) to KLIA (MAS & other International Airlines terminal). Cost for this return flight is RM474. I can’t imagine i’m here at KLIA waiting fir another 3 handsome guy, Wazari, Waja & Fu Ad. 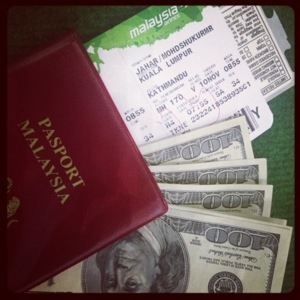 I arrived 1 day in advance and stayed overnight here at KLIA. Thanks to Zahari for accompanying me. Thanks to my best friend, Azman Jumat for his bag pack and tonnes of tips and advise on travelling. 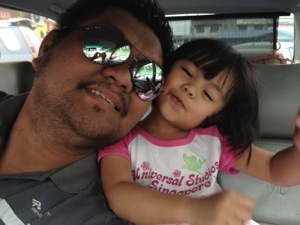 To my daughter, i will miss you badly, i will miss everything about you. I forgot to mention that there were another 2 guys joining us Hilmi & Wan Johan. There are the coolest guys i ever met.